Ambrocio Chairez and his brother, Daniel Chairez, took a risk in the aftermath of the economic recession when they opened the doors to Tortilleria El Sol in 2009. The shop, which specializes in fresh tortillas, is located at 3458 S. 13th St.
“We opened right in the middle of the recession, but we had a lot of faith and were able to pull it off,” explained Ambrocio Chairez, who went with his brother to Mexico before opening to learn how to make tortillas and to purchase the machines that they now use in their storefront. In the nearly six years since opening, the Chairez brothers’ business has grown significantly by word of mouth. “We still have never placed a single advertisement,” said Ambrocio Chairez. Each day the brothers fill orders from area residents and deliver their tortillas to restaurants across Milwaukee, including Harbor House at 550 N. Harbor Drive, Bel Air Cantina at 1935 N. Water St. and Café Calatrava located inside the Milwaukee Art Museum. Tortilleria El Sol has seven employees, but the brothers expect to double their staff once they find a warehouse to expand production and increase distribution to area grocery stores, businesses and restaurants. 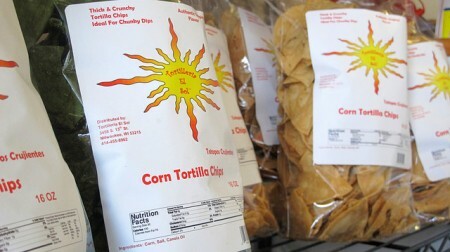 Products include corn tortillas, corn tortilla chips, tostadas and fresh salsa, and the business expects to produce fresh flour tortillas by the end of the month. A few years ago the Chairez brothers and other small business owners from the neighborhood began exploring the idea of establishing a business improvement district (BID) along South 13th Street between West Cleveland and West Morgan Avenues, and West Oklahoma Avenue, between South Chase Avenue and South 15th Street. 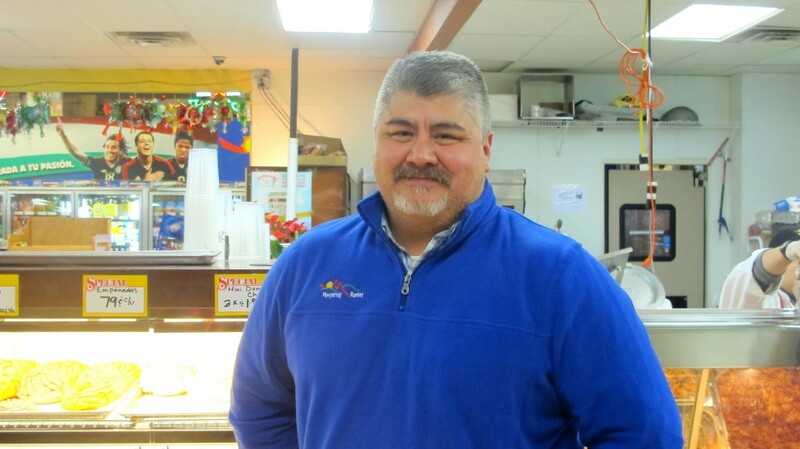 Robert Montemayor, owner of the full-service grocery store, Monterrey Market, at 3014 S. 13th St., was an initial supporter of the BID, which was approved by the Common Council in December 2013. Montemayor is now president of the South 13th Street/West Oklahoma Avenue BID board. “We want to utilize the BID to create a better environment for our community,” explained Montemayor. BID board meetings have included discussions about increasing security, starting cleanup initiatives and working to establish a neighborhood identity that would be recognizable to those passing through the area. Montemayor hopes that neighborhood improvements will help spark more economic development and entrepreneurship. Already, there is a growing dining culture that matches the diverse community, including Mexican restaurants JC King Tortas and Taqueria Arandas, and Bombay Sweets, an Indian eatery. 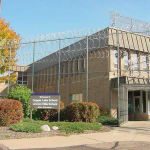 Historically, the neighborhood of the South 13th Street/West Oklahoma Avenue BID was considered the center of Milwaukee’s large Polish population, but now it is a predominantly Hispanic community. According to 2010 U.S. Census data, 63 percent of the population within the 53215 ZIP code identified as Hispanic. Montemayor and his wife, Leonor, are proud to provide jobs for 36 employees, most of whom live in the surrounding neighborhoods. “We’ve been able to be a huge partner with our neighborhood, which has been so important to us,” explained Montemayor. Linda Baker has lived in the area for a decade and has noticed a few improvements in recent years, but believes there is more that could be done. “I’ve seen that some of the stores have gotten better lighting for their windows, but haven’t noticed much else,” said Baker. Ambrocio Chairez and Babita Kumar, co-owner of Bombay Sweets with her husband, Narinder, both hope to see neighborhood security increased with the BID funds. “We care about our community and we want to preserve it,” said Chairez. 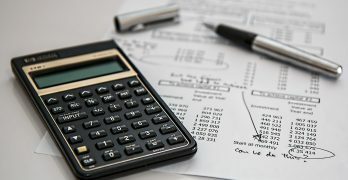 According to the Department of City Development, each commercial property will be taxed $1.10 per $1,000 of assessed value for the BID. Montemayor explained that there is also a $150 minimum and $1,500 maximum in place. In total, the BID taxes would amount to a little less than $45,000 annually. “You have to make an investment to get a better neighborhood,” said Montemayor.